One East 161st Street, Bronx, New York. By Subway: The No. 4 train (East Side) and the D train (Sixth Avenue) make stops at the 161st Street/Yankee Stadium subway station, located on East 161st Street and River Avenue. B train (Sixth Avenue) service is also available, but only on weekdays. For more information, please visit www.mta.info or call the MTA at 511. By Bus: Several New York City bus lines provide service to the Stadium. The Bx6 and Bx13 buses stop at East 161st Street and River Avenue; the Bx1 and Bx2 buses stop at East 161st Street and the Grand Concourse, a short walk from the Stadium; and the BxM4 stops at the Grand Concourse and East 161st Street (northbound) and East 158th Street (southbound). For more information, please visit www.mta.info or call the MTA at 511. By Train: Metro-North offers train service to the Stadium. For more information, please visit www.mta.info or call the MTA at 511. 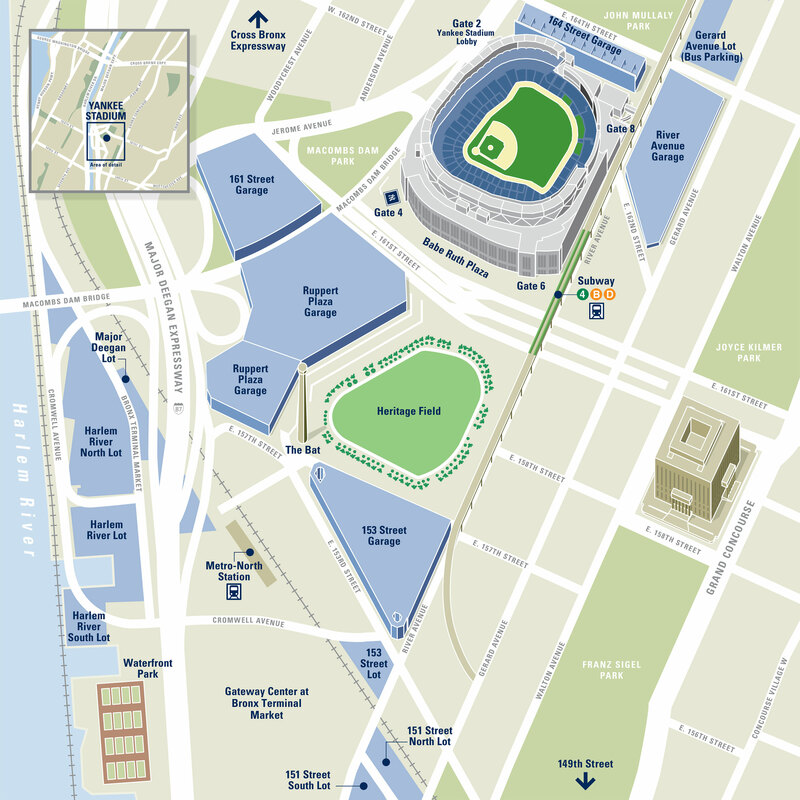 The Yankees neither control nor operate the parking lots and garages surrounding the Stadium and are not responsible for setting parking lot rates, refund policies, rules and/or procedures. City Parking was granted those rights, including responsibility for establishing and controlling parking rates, refund policies, rules and/or procedures, by New York City. Prepaid individual-game parking must be obtained from City Parking. For more information, please visit City Parking at https://cityparking.nyc/yankee-stadium/events or call City Parking at (718) 588-7817. For Yankees Season Ticket Licensees, full- and partial-season parking packages can be purchased at a discount off the game-day parking rate. Licensees should contact their Yankees representative at (212) YANKEES for more information. *Visit https://cityparking.nyc/yankee-stadium/events or call (718) 588-7817 throughout the season for lot availability.